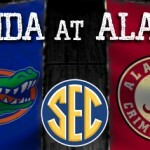 The Florida Gators‘ season was not saved on Tuesday night, but Florida (11-9, 4-3 SEC) did avoid blowing yet another double-digit lead as it inched its way past the Alabama Crimson Tide (13-7, 3-4 SEC) in the final seconds of the contest to pull out a 52-50 win at Coleman Coliseum in Tuscaloosa, Alabama. 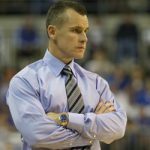 The Gators, losers of three-straight games, avoided dropping four contests in a row for the first time since 2003-04 as head coach Billy Donovan improved to 10-0 all-time against the Crimson Tide. First half focus: A sluggish start by both teams kept things close early, but an 11-2 run by the Gators – aided by four layups and five Tide turnovers – pushed Florida ahead 21-10 with 6:14 left until the break. With Alabama committing 12 turnovers and shooting just 36.4 percent from the field over the first 20 minutes, UF took advantage by making four-straight field goals and taking a 35-22 lead into the break. Perfect plays: Going up for a contested layup, redshirt junior F Alex Murphy had his shot blocked, but he gathered himself, picked up the ball and spun around for a layup. Murphy went 3-for-5 in the game with eight points. Inside the final four minutes of the contest, freshman point guard Chris Chiozza looked to be running out of options on a play when he deftly found Walker with a lob at the hoop. Standout stats: Turnovers once again (nearly) doomed Florida as the Gators committed nine in the second half, giving the Crimson Tide numerous additional opportunities to put the ball in the basket (see above), which they did by dominating the visitors 28-17 in the second half. What it means: UF found a way to pull out a close game but very little could legitimately be gained by Florida’s performance. The Gators once again blew a double-digit lead and almost allowed the Tide, which shot 39.1 percent from the field, to pick up a victory in a game the hosts had no business winning. Next up: Florida will face one of its toughest tests during its Southeastern Conference slate on Saturday when it hosts Arkansas. They don’t seem to understand they are playing for a school that has made the last four elite eights with last years final four also. Teams have been coming out looking to hit us in the mouth because of that and they have been landing haymakers on us. They need to figure out teams aren’t going to quit because we get a lead. All they need for an example is DFS. He didn’t have a great night but he really put the game on his shoulders in the last 30 seconds and got us the win. And now comes Arkansas, Vanderbilt, and Kentucky. I would say they need to improve real quick but they haven’t shown the ability to do that. A good win for this team thanks to a GREAT final minute from DFS & it was good to see Walker produce a bit. Losing last night would have been devastating to their confidence. Still, Alabama is a woefully bad offensive team & I suspect Grant will be gone after this season. Also, if the Gators have a second half like that Saturday against Arkansas they’ll lose. That Slam and Block by Doe-Doe is exactly what we this team has been missing in the last 2 minutes of games. I’ll take it. This team’s only hope of having extended post-season play is to either win out in the SEC or win SEC tournament. I’ll just enjoy the ride I guess, as much as I can. If they can piece together two halves….. I feel this team needs someone (anyone) to step up and yell in some guys faces, get them hyped up, put a little fire under their a$$es. We cannot afford to get comfortable. Yes a 13 point lead is great but they need to keep attacking. Plenty of bright spots on this team, we just need 40 minutes and a real leader, come on gators, get up and go!